The coolest, most powerful, most feature laden ignition system in the world can’t function alone. It needs to be triggered by a distributor (or crank trigger) of some sort. MSD Performance tells us that many of the ignition boxes in their arsenal can be triggered by way of a set of points or any number of OEM (and select aftermarket) electronic ignition systems. 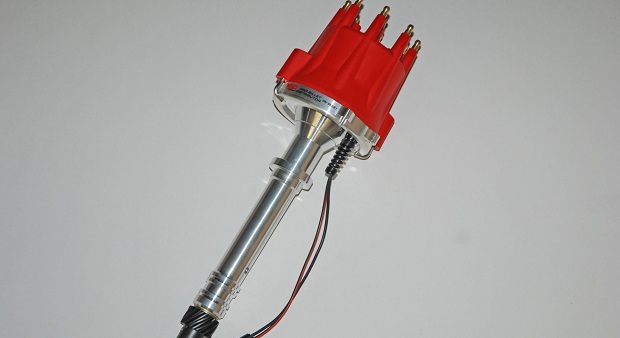 Something like a GM HEI, a Pertronix Ignitor electronic, a Mallory 9000, a Hall effect distributor and many others can be used in conjunction with the 6AL-2. The best trigger setup is most likely a matching MSD magnetic pickup distributor of some sort. Or even better, a crank trigger system. Let’s start at beginning and examine MSD’s Pro Billet distributors. Each of them features a CNC machined billet aluminum housing along with a billet aluminum base. Models are available with and without vacuum advance. 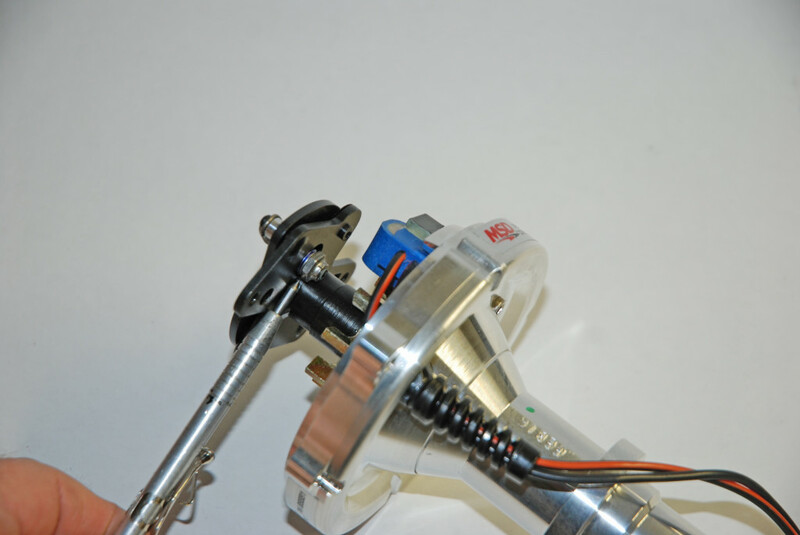 The Pro Billet distributor shown in the accompanying photos is designed for use with an MSD Ignition Control. It’s configured as a mechanical advance only model (more on advance systems later). The shaft is a polished QPQ (liquid nitride) coated, large diameter (0.500-inch) steel assembly. MSD incorporates a sealed ball bearing on the topside of the shaft that works along with an extra long sintered bearing on the bottom end (this provides increased shaft support). The mechanical advance weight pins are staked and TIG welded to the plate. MSD makes use of special nylon pads beneath the advance weights. The reason? They allow for smooth action as the weights advance. In addition, the advance system can be locked out if necessary. Internally, MSD has engineered the distributor with a special oil tract, which improves lubrication to both the distributor and the cam gear. In Chevy applications, the distributor is machined to accept o-ring seals. These seals can be used in modified blocks as a means to improve oil pressure control. 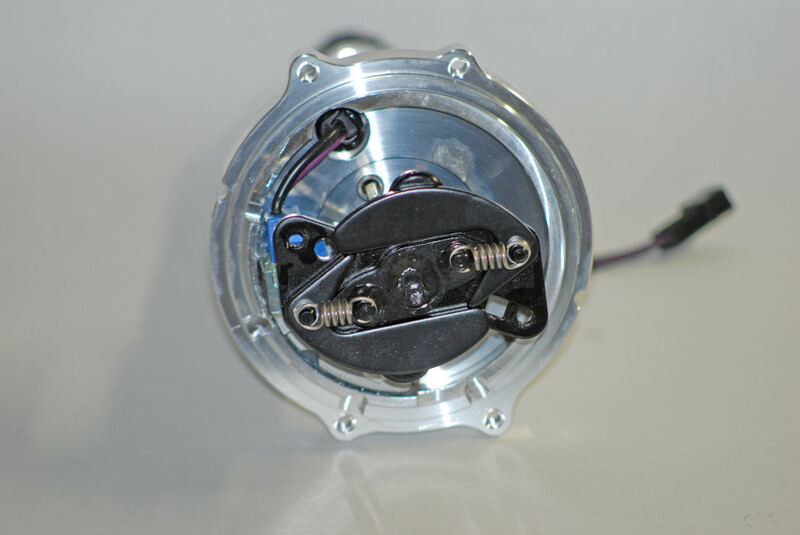 The pickup used in the distributor is a maintenance-free magnetic model that works in conjunction with a precision reluctor wheel. The idea here is to provide stable timing throughout the RPM range. 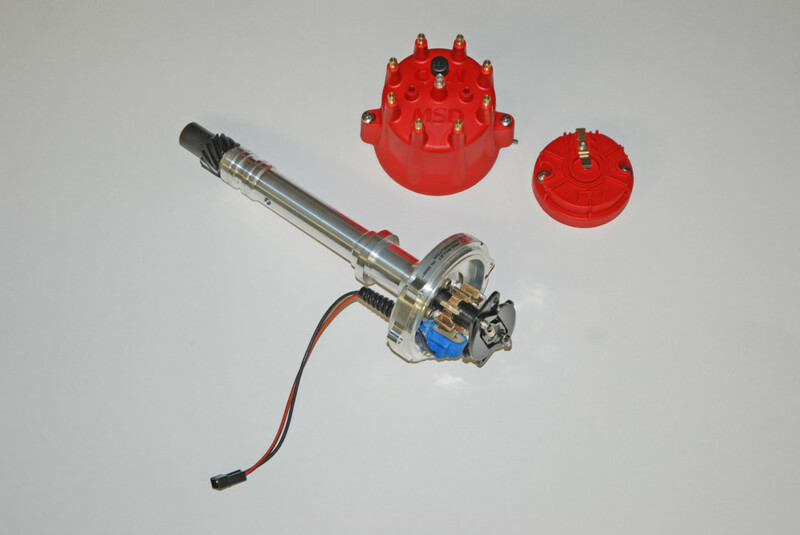 The distributor comes with a two-wire harness that plugs directly into most MSD ignition boxes. Something you’ll really appreciate is the ease of setting the ignition advance curve. As most of you know, the curve is important because in the vast majority of situations, you’ll need to bring in the spark before the piston reaches Top Dead Center. Doing this provides the spark with sufficient time to light the air-fuel mixture. As the RPM rises, the time required to bring in the advance increases. Having advanced timing tends to increase cylinder pressure, which in turn improves low RPM torque. You’ll also gain throttle response, which is important down low. It’s not all bliss however: In high gear there can be a loss of power (at higher engines speeds) if there is too much timing. That’s the reason why high gear spark retard systems have been used in many race applications. It’s also possible to dial in too much advance into the ignition system. The end result is usually detonation. Honestly, there is no one perfect curve for any engine. As a total package each racecar (or street-strip car) is different and because of this, each ignition curve will have to be different. That’s why it is important to have a distributor that can be re-curved easily. Before we dig into setting up the curve, ponder this: In most production line distributors, there are two advance systems in use – Vacuum and Centrifugal, and almost all (vintage) production line cars incorporated both systems. These advance systems operate independently of each other. Centrifugal advance functions by way of a pair of governor weights and springs, that are controlled by engine RPM. Centrifugal force shifts the weights outward against the tension of the springs. This causes the distributor cam to move which advances the timing. The vacuum advance system includes a diaphragm that responds to the difference between atmospheric pressure and induction pressure. Pre-emission vacuum advance systems were hooked to a manifold vacuum source (usually located downstream of the carburetor throttle plates). At idle and during part throttle operation, manifold vacuum is high. This advances the ignition timing. If the engine is operated at wide-open throttle, manifold vacuum is low. 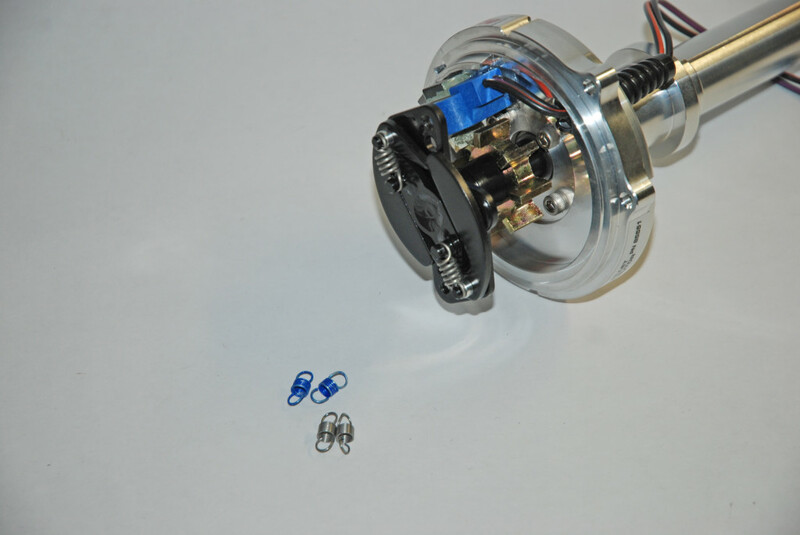 As a result, the vacuum mechanism inside the distributor doesn’t advance the timing. This all changed in the middle of the Sixties. The vacuum source was changed from the manifold to “spark ported vacuum”. With this setup, vacuum is lowest at idle and it increases as the throttle is opened (completely opposite to manifold vacuum). At idle, a spark ported vacuum system provides zero vacuum advance where the older manifold vacuum advance system might have provided as much as 10-12 degrees additional timing. Given the slew of variables most high performance (or race) distributors do not make use of vacuum advance (case-in-point is the MSD Pro Billet Distributor shown in the accompanying photos). A vacuum advance system can increase the total timing to 50 degrees or more. Obviously, there aren’t too many high performance or race applications that can accept that much ignition advance. Vacuum advance was helpful in low compression applications, where it could improve fuel economy. Total ignition timing is the sum of initial timing and centrifugal advance. For example, if a car has 12 degrees of initial (which is set by “dialing” it into the distributor by way of the timing marks on the harmonic damper) and it has another 23 degrees of timing in the centrifugal advance mechanism, the total timing works out to 35 degrees. Use as much initial timing as possible without encountering excessive starter load or engine kickback. Start the centrifugal advance just above the idle RPM. The starting point of the centrifugal advance curve is controlled by the installed length and tension of the spring. How quickly the centrifugal advance (slope) comes in is controlled by the spring stiffness. The stiffer the spring, the slower the advance curve. 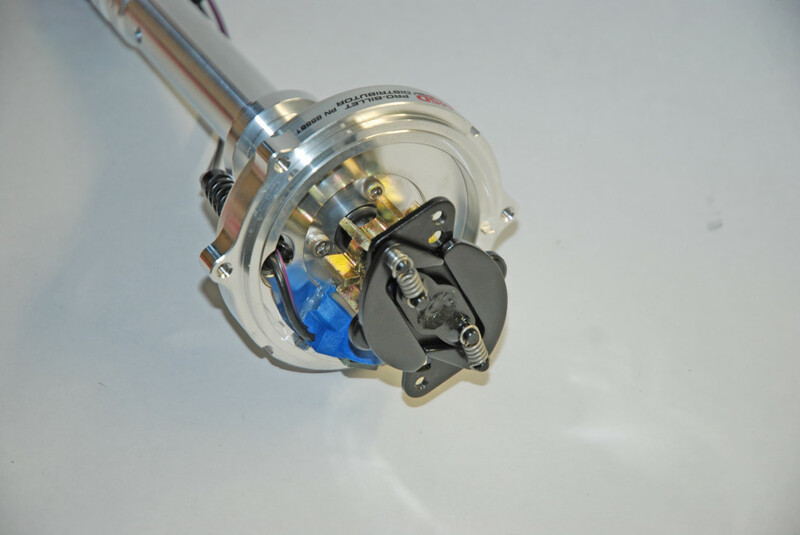 MSD’s Pro Billet distributor offers a huge range of adjustment when it comes to ignition curves. It allows you to dial in how quick the timing comes in, and it also allows you to limit the amount the timing can be advanced. The general idea is to bring the curve in as quickly as possible without the engine detonating. This means you should work with the springs supplied with the distributor to reach the ideal curve for your combination. Some applications might need one very light spring along with a heavy spring, while others might work best with a pair of light springs. Some might need a pair of medium strength springs and so on. In the end, the Pro Billet line of distributors from MSD are jam-packed with tuning features. 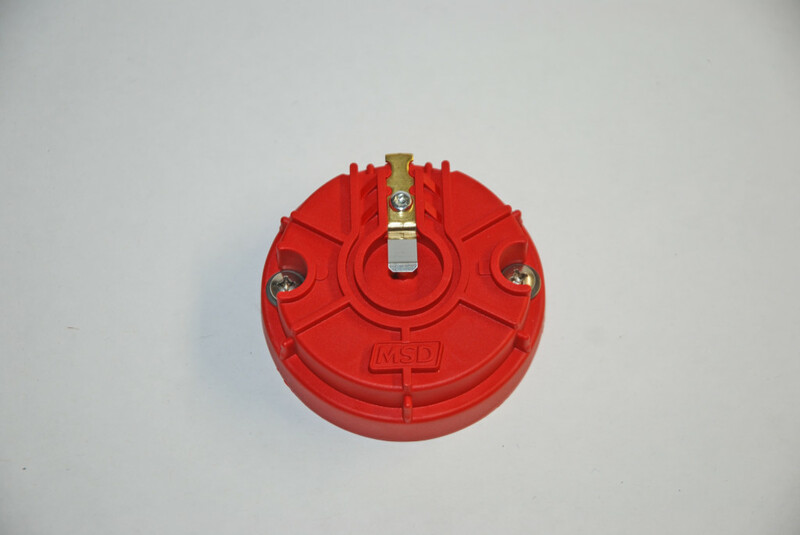 They’re also easy to work with and equally important, they’re plug and play with most MSD ignition boxes. In Part II, we’ll take a look at another option – crank triggered ignition. MSD’s Pro Billet distributor includes CNC-machined 6061-T6 housing, along with a small diameter HEI style cap. The trigger wire harness plugs directly into most MSD ignition systems. Once removed, you’ll find a bushing. You can swap it for another bushing. 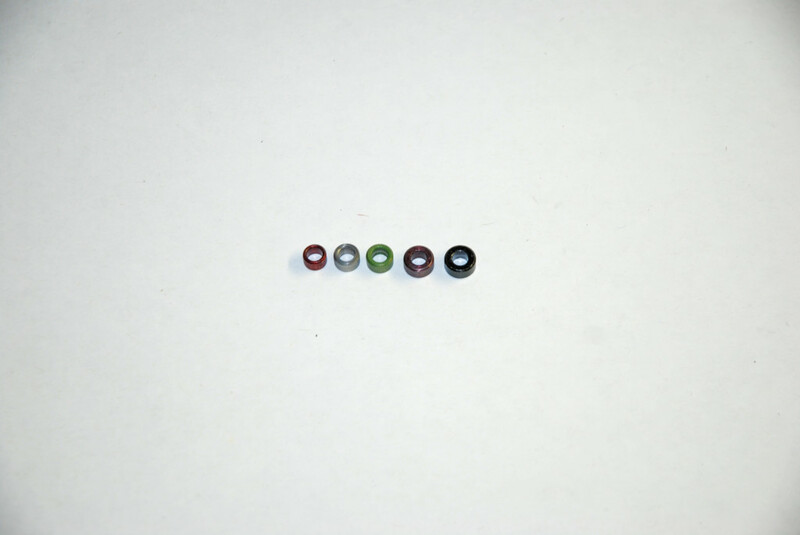 The smallest bushing (red in color) allows for 28 crankshaft degrees of advance followed by: Silver (25-degrees), Green (23-degrees), Blue (21-degrees), Purple (19-degrees) and Black, which are the largest (18-degrees). An important factor when setting up the advance curve is to limit how much advance is added. It’s not that easy on a factory distributor (we’d usually weld up the advance plate). But it’s easy with a MSD distributor. Beneath the advance assembly plate you’ll find a locknut and washer (they’re fastened to a post on the bottom side of the distributor shaft). The lightest springs included in the package are silver — they provide the quickest rate of advance. They get progressively heavier. Curve changes in the distributor are made by way of springs. Weights are not changed (which was common in the old days with factory distributors). MSD includes a wide range of springs with their distributors. 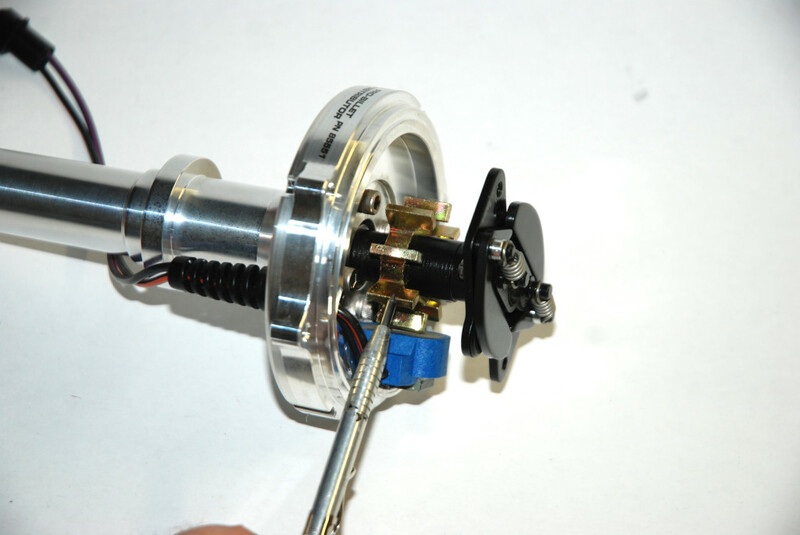 The ignition trigger is magnetic and it includes a precision reluctor wheel. This setup is designed for stable timing throughout the RPM range. The distributor is laid out much the same as a vintage Delco component. That means the mechanical advance system is located directly under the rotor. The rotor in the Pro Billet distributor is a race quality job molded from DuPont Ryanite. 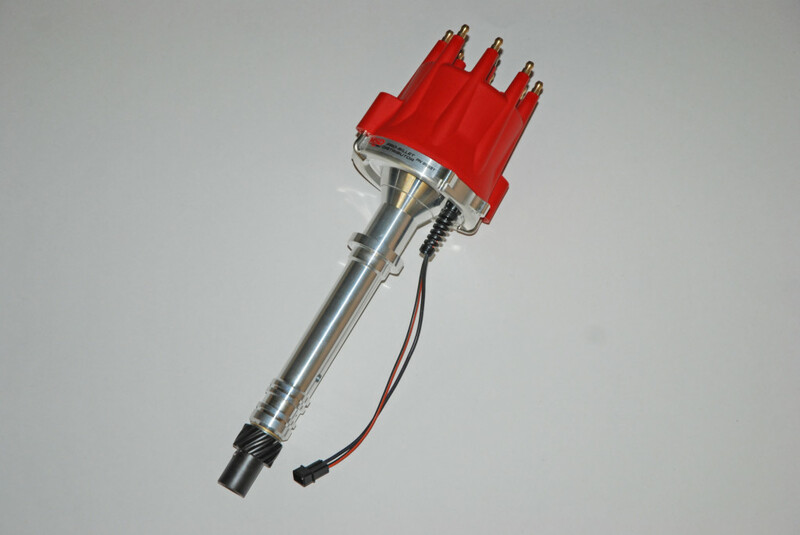 It’s designed with a deep skirt and thick vanes in order to prevent ionization and reduce spark scatter.